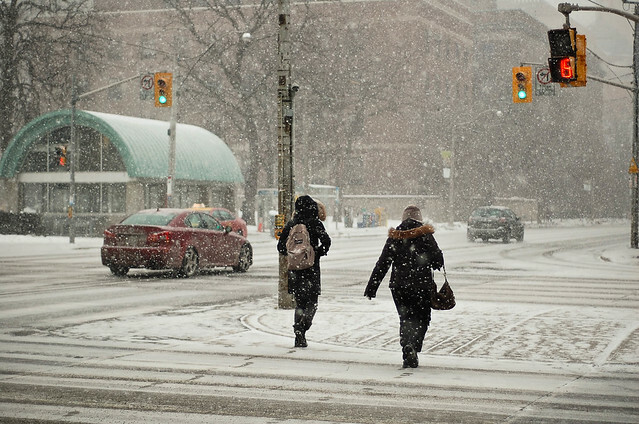 Toronto: snow, ice, salt, weirdos. Guess what's in these two pictures! ICE! I know, I didn't see it either. A couple of days ago the weather warmed up a bit and we got some rain. That night it got real cold again, and it's only been getting colder and colder. I guess all the slush just froze.. 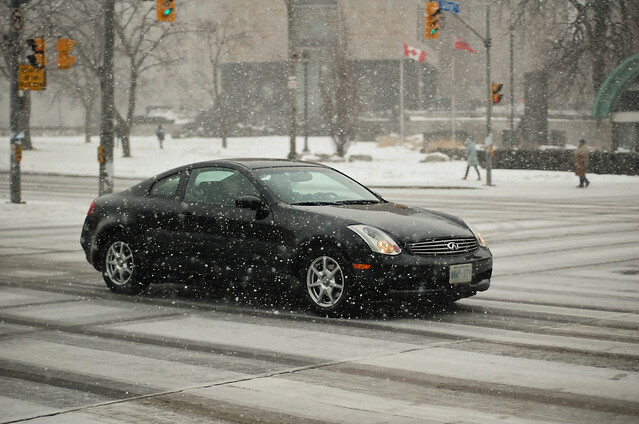 I found the bigger roads to be absent of these, but some of the smaller streets around my place were pretty frozen. And yeah, I took my first fall of the season today where that second picture is taken. When I got up, a nice old lady asked if I was okay. Then immediately after telling me that's why she doesn't bike in the winter, she slipped as well haha. Anyways, today was pretty freakin' cold, but I haven't brought my camera around with me in a while so I took this opportunity to take a couple photos while it was beautifully snowing. Read on to check out some more pictures! You can see from these photos that it was snowing quite heavily. The snow piled up pretty quickly! 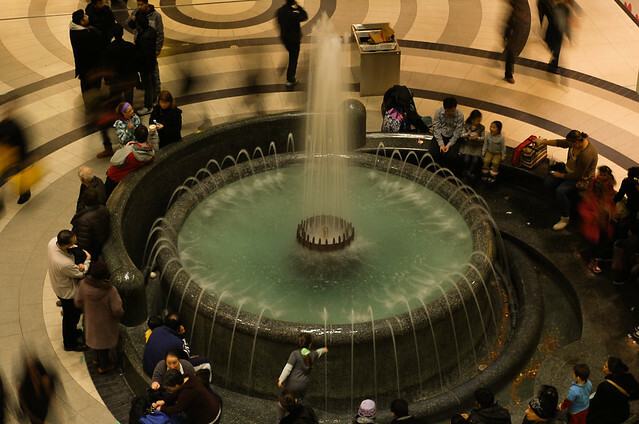 This is a fountain inside Eaton Centre. And while I was inside, I spotted this fat weirdo walking around in a tutu. Also, this is my bike locked up outside Eaton Centre. Within a span of less than 45 minutes, my bike was covered snow. All in all.. It's cold here. I'm starting to get tired of it haha. I think it's mostly the winds though. That's what really kills me when I'm riding around.. I also need proper winter gear I guess. Gloves with holes and 2 year old sneakers don't cut it for this type of weather I guess haha. Oh well, better luck next year!